Mac users with an Apple Watch can unlock their Mac by simply wearing their watch, thereby bypassing the need to enter a password at the boot and login screens. 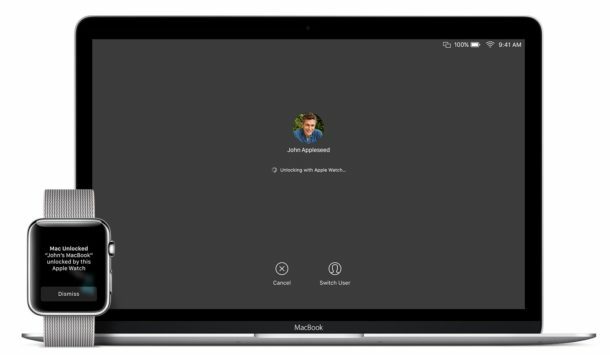 This great feature makes logging onto and unlocking a Mac remarkably easy and quite fast for Apple Watch wearers, but you’ll have to enable it first. 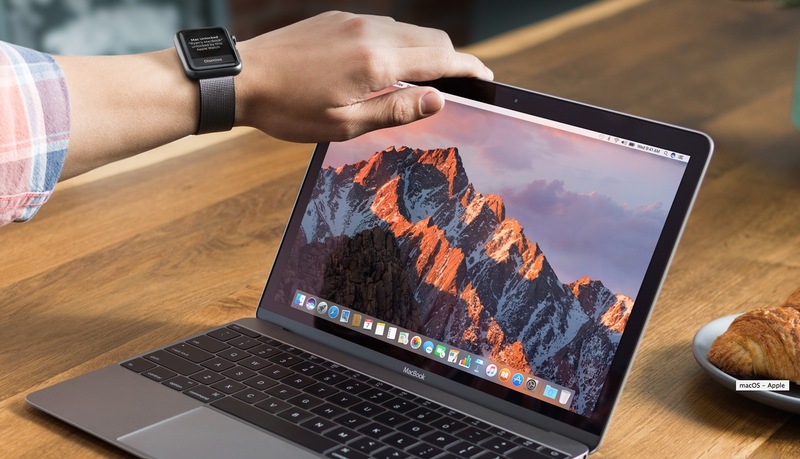 Before enabling the ability to automatically unlock a Mac with an Apple Watch, you’ll need to meet a few simple requirements; you will need a Mac running Mac OS Sierra 10.12 or newer, you will need an Apple Watch running WatchOS 3 or newer, and the Mac must be a mid-2013 or later model. Aside from that, be sure the Mac and Apple Watch are using the same iCloud Apple ID, have two-factor authentication enabled for Apple ID, and have Bluetooth and wi-fi enabled. Done! Once the “Turning on…” indicator text within the preference panel goes away the feature is enabled and you are ready to use Apple Watch to unlock the Mac. You can immediately try this feature on your Mac to make sure it’s working. For a laptop simply close the lid on the MacBook to make it sleep, then wait a moment and open the lid again, the regular login screen will appear but in a moment it will disappear as long as you are wearing your Apple Watch – there is no longer any need to enter a password to get passed the lock screen on the Mac, it will automatically authenticate with the Apple Watch instead. Both Apple Watch and the Mac will show a message on their respective screens demonstrating the feature is unlocking the Mac. This works quite well and is very smooth, and it makes for yet another great reason to have an Apple Watch. Note if you are not wearing your Apple Watch, or the Apple Watch is not unlocked by entering the devices passcode, the Mac will not automatically login. 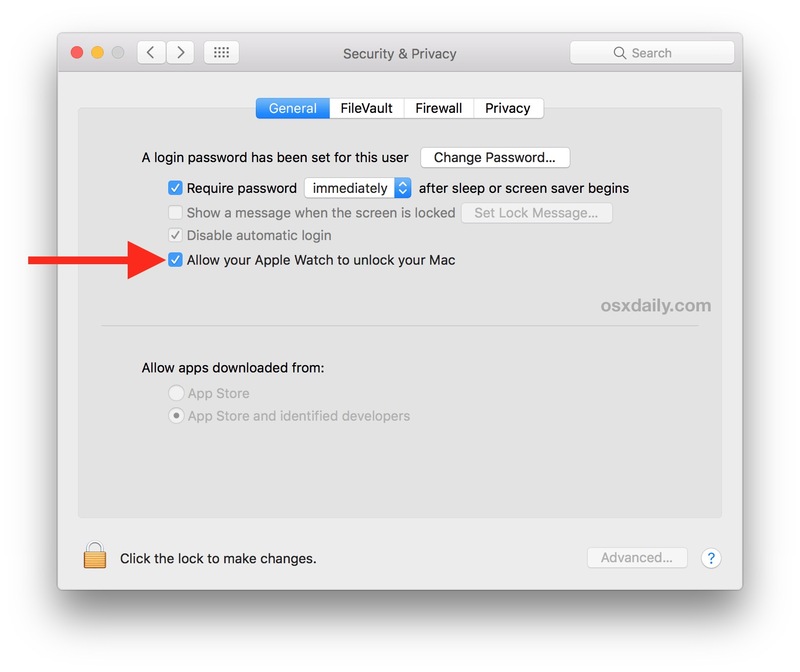 Instead, the Mac will require a password to login and unlock as usual. First, be sure you have a Mac that is compatible with the automatic Apple Watch unlocking feature. Any hardware from mid-2013 onward should work fine. Next, be sure the Mac has Mac OS 10.12 or newer installed. Additionally, the Apple Watch must be running WatchOS 3 or newer. Having the same Apple ID and iCloud login for both devices, along with two-factor authentication enabled for that ID is also required. Enabling Bluetooth and wi-fi are necessary on both devices, if one is disabled the feature will not work at all. You’ll need to be wearing the Apple Watch and have it unlocked in order for this to work. You’ll also need the Apple Watch in close proximity of the Mac, you can’t unlock a Mac that is in another room for example. The most common reasons the Apple Watch is not automatically unlocking a Mac is a discrepancy in requirements and what is set on the devices. Typically this means something like Bluetooth is off on the Mac, or the OS is not updated to a modern version, or Two-factor authentication is not enabled, or the Apple Watch is not unlocked from its pincode, etc. Thus, review the above information and try the troubleshooting steps, you’ll likely get the feature working in no time. If you have any thoughts, tips, tricks, or troubleshooting steps about getting Apple Watch to automatically unlock a Mac, let us know in the comments! And for those of us without an Apple Watch, there’s always MacID. It comprises an iPhone app together with a MacOS app. I’ve started using it recently and it’s a very good alternative. Frankly I think Apple should also build the functionality into the iPhone since I suspect that more people have in iPhone in their pocket than an Apple Watch on their wrist, and the existence of a third party app shows that it’s feasible. Out of curiosity, why is this functionality only limited to Mid-2013 and later Macs? Is there really something in the hardware that makes this possible? If you’re talking about MacID, it’s because Bluetooth LE is required, which is not available on the older Macs. I trust this is also the case with Apple Watch. Bluetooth LE is also required for some other cross-device features such as hand-off. Indeed. This is basically the only compelling reason for me to hang on to my Apple Watch at this point. It’s sweet, to be sure, but really it would be better with my phone. Why?Is it only available in Sierra? Shuttercritter, there’s a great article that explains exactly what you’ll need to get an Apple Watch to unlock a Mac. I would suggest reading the article, here is a link. It’s a good feature, a shame that it doesn’t work to older hardware. My wife bought a MacBook last year, and we have found that although new, it was manufactured pre 2013. Quite disappointing really. Well if you had done a little research, you would have known that before you bought! What’s the range of this? I hope they limit it to very short proximity. It’s pretty short, I find after about 6 feet it fails. They lost me at 2-factor authentication. I don’t trust Apple’s “cloud services” enough to use any of their buggy authentication/security features that have a chance of locking me out of my own stuff. Nope. Too many horror stories out there. Work’s only sporadically with everything authenticated as written above. Finally reverted to Macid which works well. Maybe I missed it, but the article doesn’t seem to mention that when enabling the above, the Mac will also remind the user that he/she has to have wrist detection enabled and have a Passcode on the watch. This only works now and again using all the prompts above…any other thoughts?